Have you been searching for the perfect paint colour? Have you been scouring Pinterest and countless decorating magazines looking for that 1 special colour that makes your heart POUND with excitement? If so, then I’m sure you’ve realized that finding the ONE special colour that looks good ALL the time can be a daunting task – it’s like trying to find the best red wine to go with fish, steak and Cheerios. Why is it a chameleon colour? Well really, ALL colours are chameleon colours as they change their look as the natural lighting changes throughout the day. However, while all colours will change, not all of them change for the better. You know, that lovely gray that turned green? Or that beautiful beige that turned pink? Those sneaky colourful undertones will get you every time! And like the others, Ballet White WILL change throughout the day HOWEVER…it always looks good (says me). Why does it always look good? Because it always stays neutral. It is easier to like or dislike a ‘colour’ because colours tend to have emotional responses attached to them, whereas neutrals tend to have ‘neutral emotional responses’ attached to them. If you don’t like green then you DON’T LIKE GREEN and it’s an emotion you’ll be feeling. If you hate red, then you HATE RED, again it will be emotional. 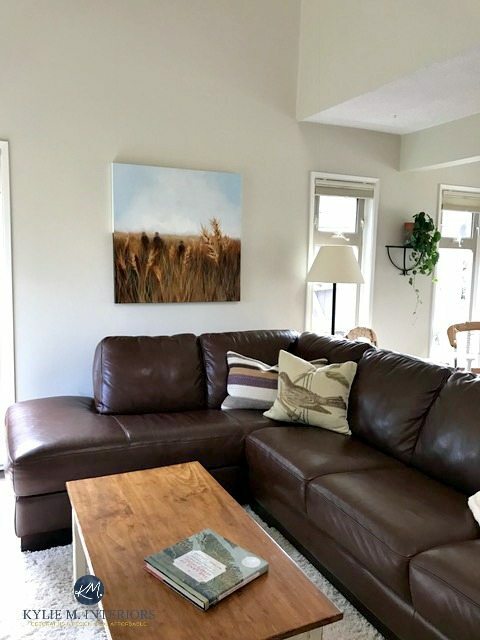 Now you may not get excited about neutrals, but you probably won’t hate them (another reason why neutral paint colours are so great for Home Staging). What are the undertones of Ballet White? This living room shows how neutral Ballet White can look. However, notice that even though it ‘looks’ neutral, it still has a slightly warm foundation peeking through. The LRV of Ballet White is 73.68 which means that it’s a relatively light colour that will add light to the room, rather than absorb it. Generally speaking, LRV’s below 50 can absorb light and above 50 they start reflecting light. Ballet White is a great choice for an exterior as the intense natural light really makes ALL of the aspects of Ballet White (yellow/cream/beige/gray) recede and it just acts like a light neutral colour with no dominant personality or colour shining through. This works great with colourful shutters, front door and landscaping! Ballet White brings its a-game on the outside. If you’ve read my post re: Picking Exterior Paint Colours, you’ll know that exterior colours tend to come up a bit lighter than you THINK they will. Ballet White proves this point nicely – without looking white or stark. Ballet White vs Gentle Cream. Even though Gentle Cream is ALSO a cream with a neutral base, you can see how much more neutral Ballet White is in comparison. Ballet White will come across a bit more fresh, light and significantly more neutral than Gentle Cream. Ballet White vs Manchester Tan. Manchester Tan is a popular beige paint colour with a slight greige undertone. Comparing these 2 colours will show you how soft and subtly warm Ballet White is. Not sure if it’s the right colour for you? Check out my affordable Online Colour Consulting Services – Affordable and fun! Kylie M Interiors Interior Decorating and Design Blog E-Design and Online Virtual Colour Consulting Based in Nanaimo BC Canada and serving the whole darned World! Just wanted to say thank you for the great post on Ballet White. It pretty much saved me from losing my mind !! I think I brought home hundreds of paint chips and bought dozens of samples all with very disappointing results. The lighting in my living room (which is west/southwest and faces a marina) brings out undertones so much so that even the slightest hint of orange, pink, yellow , green comes boldly through and dominates. I wanted a light neutral for that reason, but every one I tried seemed to scream out its undertone or look dirty. That is……. until Ballet White!! It is truly perfect, looks beautiful at all times of day and never looks dirty. It goes from a light cream to a soft, light greige but is always interesting and doesn’t wash out like so many off whites I tried. I liked it so much that I also used it for the front hall and stairway, which has the opposite lighting and is a much darker space and it looks great there too. I chose White Dove for my trim and they look really pretty together. I liked Ballet White when I first saw the chip, but it was your great review that convinced me to go for it and I couldn’t be happier. Hi Carolyn,, thank you for taking the time to send a note! It is an awesome colour, isn’t it! It’s notes likes yours that helps other readers have the confidence to jump ahead with their painting projects, so I SO appreciate the feedback! This post was a life saver (I too was losing my mind much like Carolyn and this really, really helped me narrow it down)! I’ve got a sample of ballet white and it’s very interesting – it seems to look different on every wall but very pretty so I think I’m going to go for it! On the other hand, I also got a sample of revere pewter and it looks straight up purple. Which I was NOT expecting (no one on the internet ever mentions revere pewter looking purple)! Anyway, I can see tinges of pink or purple in the ballet white as well (only in certain areas and angles) but nothing like that. It’s clear there is something in this room trending the colours that way (probably the bright orange fir floor), and I don’t want that – so my question is what trim colour do you normally suggest to go with ballet white?? I’m stumped on this now. I’m worried that something like white dove (with a slight yellowy undertone) will bring out any sneaky purple tones in the ballet white. My understanding is that yellow amplifies purple tones?? Anyway – I’ve noticed there aren’t many comprehensive blog posts out there about what to do with your trim when you are going for off-white walls – or at least I haven’t found any! (like whether to create the most contrast possible by going for super white trim, or go darker with the trim, or to paint the trim the same colour as the walls but in a different sheen; or how to avoid the walls looking dirty). Idea for a blog post maybe?? Unless you’ve already written it and I’ve missed it. Thanks! Love your blog, it’s been a huge help! What a great article. Getting ready to paint outside of my house and I currently have 10 shades of white samples painted . Is there a SW paint color that is the equivalent to BM ballet white? Thanks!! Hi Nancy! Nope, I wish there was, but keep in mind that SW usually does pretty good colour matching, so you could have them whip up a sample pot for you to see how it looks! Hi Ali! When it comes to personal questions, I do try to refer to my E-design, so I’m not guessing on things. Off the top of my head, check out SW Neutral Ground, it has a ‘similar’ look to Ballet White. Otherwise, you can ask SW just to colour match it for you! Need help in choosing a wall color to go with my all over home trim and doors that are Ballet White. Currently , it is Believable Buff. I also have med. toned hardwood floors throughout. So, it is just way to warm for me and is so yellow! I’ve been sampling several colors and haven’t fallen in love yet. Foyer and hall are NW with just a few windows that let in natural lighting. It is open to the living room with two big windows on either side of the fireplace they are SE facing. The fireplace trim is also all in Ballet White. So, no cool tones in the home at all. I read your article about having equal amounts of cool tones or you feel like something is off. That is how I feel about the home. I am currently thinking of using one color and carrying it through to the kitchen , which is to the left, with very minimal natural lighting. Same colors in the kitchen, almond subway tile and have brandon beige cabinets The paint looks very yellow up against the cabinets and its driving me nuts! I’ve repainted my dining room, from a dark brownish taupe color to SilverMist BM. Its pretty, but, not as dark as I was hoping for. Looks more light blue most of the day. Any suggestions? I was thinking gray at first, but, doesn’t brighten as much as I wanted and also goes blue, except for Classic Gray BM. Its very nice as is Halo. However, not too sure I like it up against the trim. Sorry this is so long!! Well that is what I like to hear – cheers to that!!! Hi Kylie- I have read nearly all your color reviews, love them!. 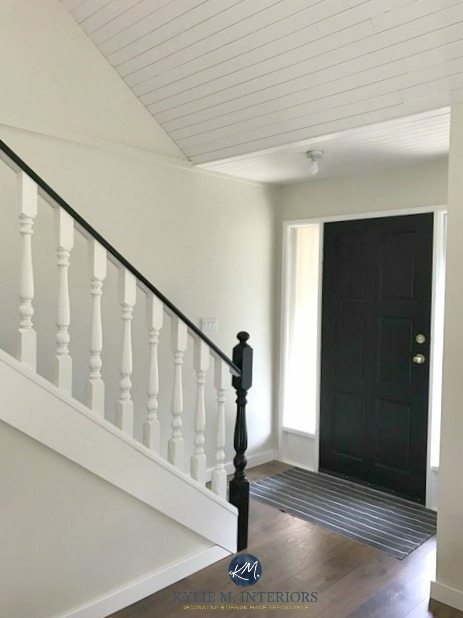 I just bought a house and have been struggling with finding the perfect color for my house with poor natural lighting. I have revere Pewter in my kitchen and love it, but when I extended it into my dining room I did not like it. The rest of my home is a darker gray and i am looking to lighten it up. Would ballet White do the trick? I have also considered white dove but am worried it will be too light. How does ballet white compare to dove white? Hi Katie, I can just touch on this quickly, but Ballet White could be a beautiful choice. It’s warm but has a great neutral base, which it will likely fall back on if your home is more shadowed). Hope that helps! Hi Melissa, that one is Manchester Tan – it’s a great beige/neutral! Hi Melissa, I believe that is BM Coventry Gray! Hi Katie, yes it can be tough! Pale Oak is not super comparable as it’s more of a greige with a soft, feminine undertone. However, you wouldn’t need to worry about the creamy/yellow popping up on you! If you’re having trouble finding a white for most of the house – which is more versatile for south and north rooms different floorings I can’t change – ballet or SW alabaster? Thank you so much! Will Ballet white work well with a green undertone scheme? In some of the pictures I almost see a green undertone but you only mention the yellow/beige/Greige (Greige is also in the scheme). I am thinking of using ballet white on the exterior of my home. The paint swatches I tested make it look beige, but I’m wanting more of a creamy white. When I look at pictures, it looks like a nice white. Does the color change when you paint it on your entire house? Also we are doing simply white on the trim, is that a good one to pick? My husband and I renovated our house this year (down to the studs!) I used Ballet White all over the house based on the advice you had given in the past. I’m very happy with how it has turned out. Once again an amazing review. After purchasing the E-design in the past and painting our bedroom Big Chill, I just love reading your color reviews. Every time I look at the walls in our bedroom, I am amazed at the way color changes based in time of day. Do you have any suggestions for an accent color (in the darker blue or grey family) to go with the ballet white? I am thinking of using it in the powder-room, but want to paint the vanity as well with a pop of color. Love your emails and your advice…you have really answered questions of the universe (and wine)! am correct, but I like it anyway. My question is: how is it different from Ballet White, and how would it contrast with Dove White trim? Love, love, love your articles! Which Sherwin Williams trim do you recommend to go with BM Ballet White? I like more of a soft, subtle look, rather than a stark, contrasting look. Thanks! Love all your blogs! Need to send you pictures of my nearly completed e-design bathroom! It looks great! Thank you. My question is, what SW color is most like Ballet White? Hi April, your best bet would be SW White Duck which is DAAAAAMMMN close! How does Ballet White compare to my “go to color” Neutral Ground? Ooo Cheryl, you are GOOD, they are close! Neutral Ground has a bit more depth, while still being in the light range. It also has some more beige/cream warmth to it as well. But really, similar idea! Hi Kyle! Wellll, I wouldn’t call it a creamy white, more of a creamy off-white, so if you’re okay with the depth then it’s a good one! Hi Kylie – I’m a faithful reader and always find your advice on paint colours so useful. Not to mention you are as funny as heck! Just curious how Ballet White would compare to BM Seashell? I used Seashell on my main floor and really like it. So would it go okay in a north facing room? Will it add some color (to differentiate it from SW Extra White Trim/crown molding) without making the room drab and lifeless in the midwestern winters? Thanks to your review I decided to go with ballet white. It is the perfect off white.. I love it.! I’m stumped with picking the right white for the trim and base though. PLEASE HELP!!! People are saying simply white ? Or dove white? Or another perfect white? What would you choose ? Hi Sarah! Well, with the painter/builder, it’s not them that has to mix the paint, it’s the paint store, so whether the paint store mixes their own colour or another should be irrelevant! (Trades can be a bit weird sometimes about things…). And of COURSE, SW doesn’t have a direct comparable. But REALLY…you should be able to have them colour match. Go into the store yourself and have them do it, so you can check it in person. If all is good then that should be MORE than enough to go forward. Short of that, Shoji White can be nice, but CAN sometimes flash a tiny (like wee tiny) green. I also love SW White Duck and Sw Neutral Ground. Again, not the same, but similar idea. wonderful post as always!! Can you do a crisp white trim color with this color on an exterior? Thanks so kindly for responding! I love your color reviews! They have been so helpful as we have painted our home. I am looking for a paint color to put above white dove wainscoting in our north facing bathroom. I read your review of SW Wool Skein, but the green undertones are a bit to strong with the Travertine tiles . I think BM Ballet White might be the perfect color. However, I am looking for a LRV of 62-64. Could I just darken Ballet White by 50%? Or is there another color that would be darker but similar to Ballet White? Hi Krista, you can definitely try Ballet White 25% darker or look at BM White Sand, just keep in mind, as a colour like Ballet White gets darker it will lose its creaminess and turn more beige! Wanting to paint three bedrooms in a pale neural. Our trim is currently Benjamin Moore white down, which we do not want to repaint. So far we have tested Pale Oak…did not work. Thinking of perhaps ballet white or Navajo white. Something that will complement the trim. Bedrooms face east and are not very large. Furniture tends to be dark, white California shutters on the windows. I have googled and researched Pinterest but am becoming more confused. Hope you can help! Thanks so much…any ideas greatly appreciated. Your blog is very helpful! I am painting my exterior wood siding Ballet White and need a color for my shutters and doors. Do you recommend a complementary colors with Ballet White ? Hi Katie, thank you for asking! I actually have an E-design service (which is currently on vacation) for just this purpose, this way I can look at your roof and any brick/stone, otherwise I’m 100% guessing!